Maytronics is proud to introduce the new generation in robotic pool cleaners. 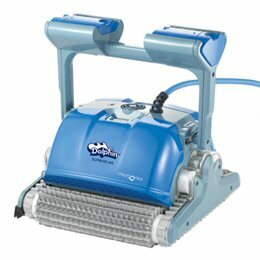 The Dolphin Supreme M4 is a significant step up in robotic pool cleaner technology based on Maytronics' many years of experience. - Recommended for pools up to 12 m (40 ft) in length. - Cleans pool floor, walls and water line. - Brushes, scrubs, vacuums, and filters the entire pool including the floor, walls and waterline. The new, advanced technology enables optimal scanning and pool coverage in a shorter cycle time. - Add-on extra brushing system is twice as efficient. The rigorous brushing and scrubbing action reinforces the elimination of algae and bacteria. - Patented pending top opening filtration compartments for easy and convenient maintenance. - Patented pending Multi Filtration System (MFS): Ultra fine, Ultra fine disposable, and Spring cleaning. - One-way water valves prevent the escape of debris and ensure rapid water drainage. - Adjustable floats allow efficient scanning in different pool sizes. • Automatic motor protection mechanism. • Low voltage motor provides minimal energy consumption. - Automatic shut off at end of each cycle. - DIY – easy maintenance, at user and local dealer level. - Suitable for beach entry pools. - Three year warranty (all parts included).